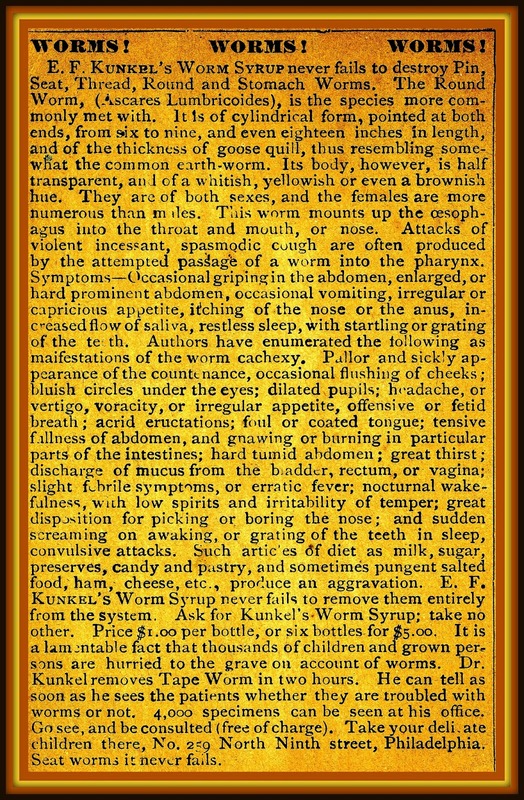 Let E.F. Kunkel "cure" Your Ills! Here in the USA, since 1906 we've had a law called "The Pure Food & Drug Act" which has protected us from those who would take advantage of our ailments to sell us stuff that does nothing to cure us, but might distract us from our pain. After the Act was passed in 1906, drug companies had to list ingredients on their containers and medications that had incorporated such poisons as arsenic, lead, etc. largely disappeared from pharmacy inventories. While it is tempting to scoff at our ancestors as ignorant for believing in the curative powers of all sorts of weird stuff, we buy some of the same sorts of things today and are just as likely to spend money foolishly when we are frightened by our imaginations. Drugs are now tested before they are marketed. Dietary supplements, however, are not covered by the provisions of the Act. While regulated medications are sold with disclaimers as to their possible side-effects, if you're looking to make money in 2017, you can sell all sorts of cheap, ineffective dirt for high prices by calling the stuff a "dietary supplement." Do you have a headache (yet)? 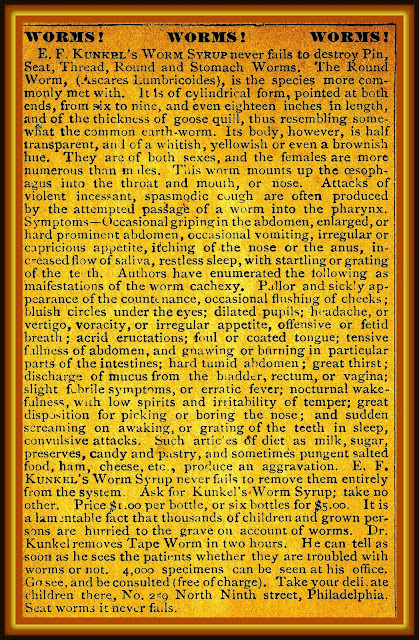 You might have (aargh) worms! ...For which, of course, we have the cure! So how does good advertising get us to buy all this junk? It stimulates our imagination. Even those of us who are perfectly healthy (for our age) can be motivated by the fear of sickness and death or the suggestion we might be healthier still if we just bought a little more of this or that to change our circumstances. Advertising magnifies our distrust of "experts" and "big government." It motivates us to vote based on our prejudices rather than our best interests and tells us we have no style. In short, it selectively informs. Advertising lies. 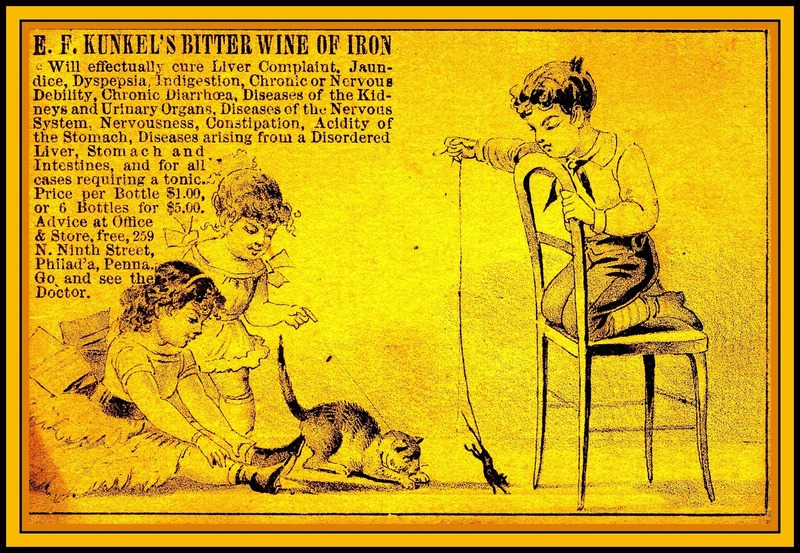 No, Kunkel's Bitter Wine of Iron would not cure all these health problems. Advertising, however, has some unintended good consequences. Whether it originates with commercial or governmental sources, it preserves history, involuntarily recording the fears and aspirations of the populations at which the ads were targeted. Prejudices against certain types of people are faithfully reproduced. Aspirations for a better life are consistently woven into ad copy. Future generations can look back at old ads as faithful recordings of the tenor of their times. Quite by accident, that incurable liar, advertising, is truthful. In addition, advertising media accurately reflect advances in technology. As an advertiser myself, I am constantly bombarded by invitations to spend money on advertising platforms that I'm told will get my message to new audiences. Supposedly, younger generations are no longer interested in old platforms like books, newspapers, radio, TV, roadside billboards and ... you guessed it ... trade cards. Both advertisers and customers search for maximum value at minimum expense. Face it. Though we're all cheap, anything "new," including new technology, grabs our attention...and our money. Designed to be captivating, advertising can be beautiful. What made 19th century trade card advertising so notable was the fact folks thought it so extraordinary it was worth collecting. Take a look! I think you'll agree. The advertising cards showcased via the hashtag #bestarnoldcards from the Earl J. Arnold Advertising Card Collection 1885 are among the most colorful ads you'll see anywhere.